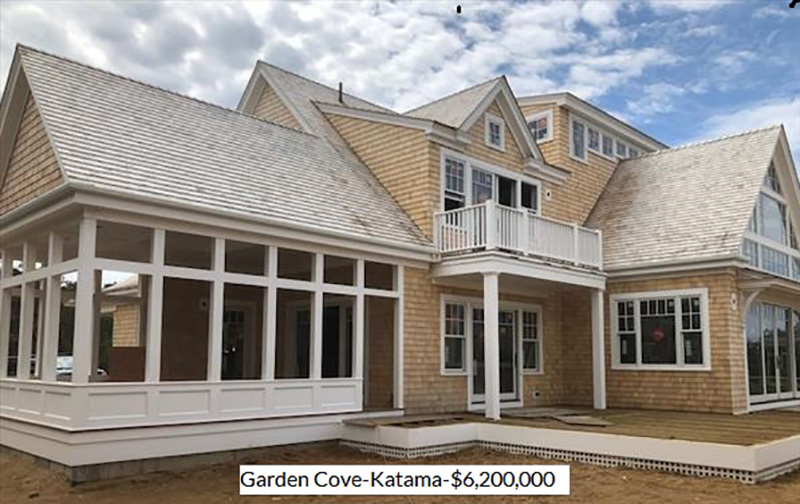 Real Estate Confidential is a weekly chitchat about new listings, sales, or other insider info on the Martha’s Vineyard real estate market, by Fred Roven, Martha’s Vineyard Buyer Agents. It appears each Friday in The Minute. You know it the moment you walk in the front door. Nothing quite compares to the look, smell, and feel of walking into the clean slate that is new construction. The garage is empty, the kitchen is new and the backyard awaits only your needs and creativity. Pricewise, you may find new construction 20 percent higher than resales. Perhaps when you’re trying to justify that additional expense, you imagine using those dollars for other expenses (because you can handle the repairs on your own), but do you really have that spare time? If you want to enjoy your home without having to worry about constant repairs and maintenance, than buy new. Don’t let your home take up your valuable time or money. One of the best advantages of moving into a new home is you can indulge your personal tastes. 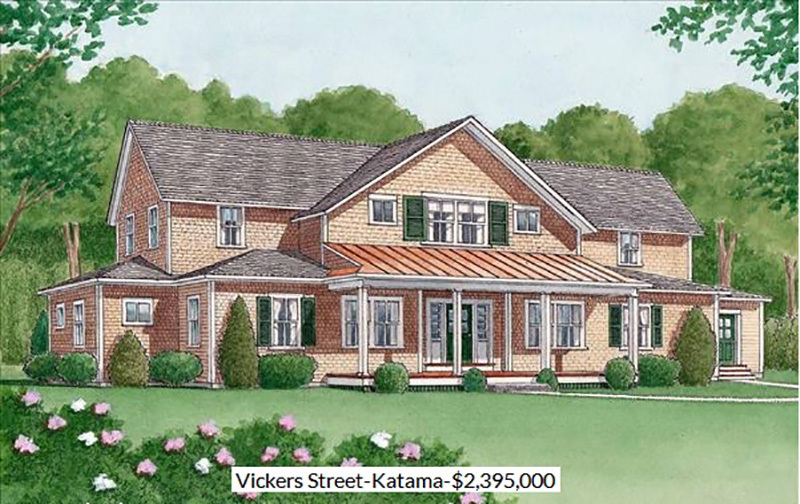 New home layouts feature more open spaces and rooms that flow into each other more easily. That feeling of spaciousness is enhanced with higher ceilings, larger, higher windows that bring in plenty of sunshine, double-sink bathrooms, and expansive closet space. You have the advantage of customization to match your personality rather than someone else’s vision and to reflect the way you live today. A used home was someone else’s dream, not yours. New homes are more environmentally friendly (greener). The building envelopes — the actual structure of the homes — are now designed to minimize the transfer of heat, cold and humidity both into and out of the home. These homes have windows with that in mind, and walls that provide tighter finishing with better insulation and sealing. Newly constructed homes often include green systems and appliances: high efficiency kitchen appliances, water heaters, furnaces and air-conditioning units. These “green” homes are more energy efficient and reward you with lower utility bills. New homes built today can use up to 50% less energy than a home built in the early 80’s. Your new “Energy Star” appliances are also more efficient, lowering utility bills even more. Because of new energy standards and stringent building codes, combined with state of the art ventilation and air filtration, you will experience higher indoor air quality and year-round draft-free comfort. Some new homes are plumbed and ready for alternative forms of energy which can reduce energy costs even further. 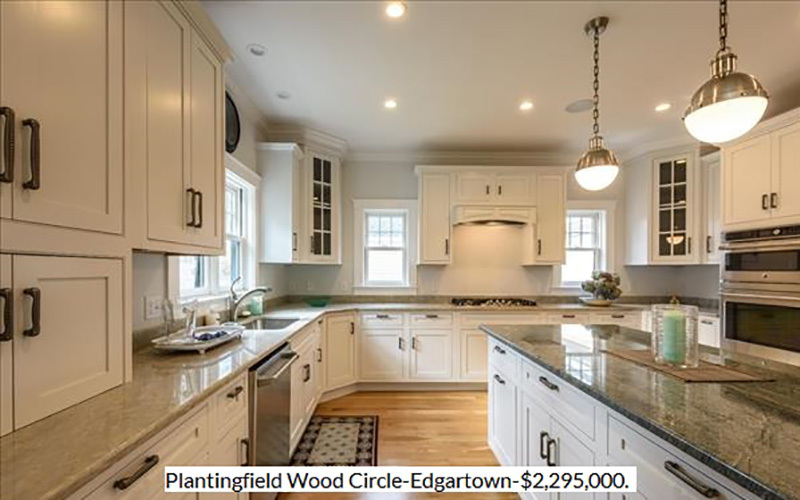 Today’s new homes are engineered specifically to minimize maintenance requirements using sustainable hardwoods or composite products for exterior trim. 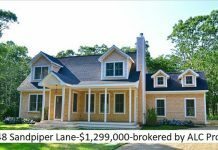 With most homes on Martha’s Vineyard sided with wood shingles, having vinyl windows and and no maintenance trim leaves hours more time to enjoy your sanctuary. Another financial benefit of new properties is with new appliances, plumbing, heating and air conditioning, you will not have to spend much on maintenance or repairs for years to come. What problems that may arise are usually covered by manufacturer’s, builders or the purchase of extended home warranties. 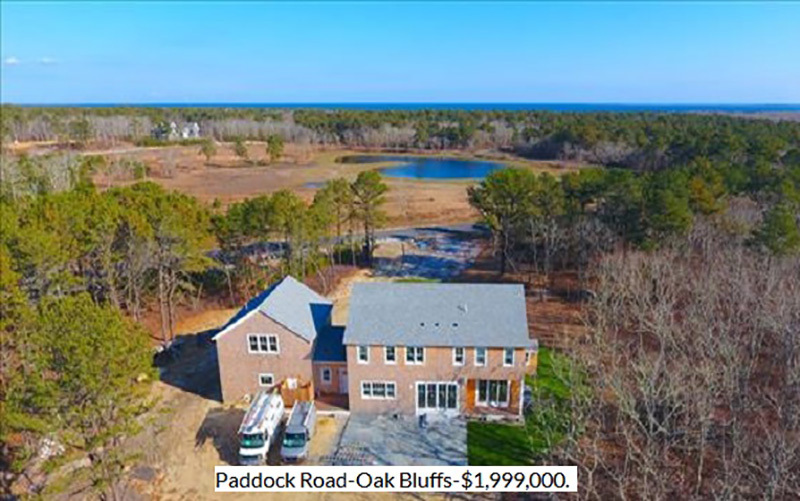 By far the best value in new construction is the property at 12 Isaac Avenue in Oak Bluffs priced at $859,000. 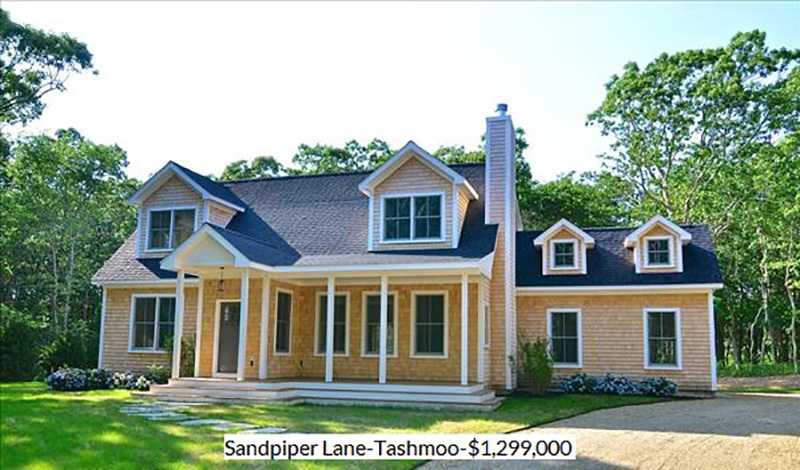 This 1900-square-foot home includes 3 bedrooms and 2 ½ baths plus air conditioning; it was built by one of the Island’s foremost builders, and this quality could not be duplicated at this price. 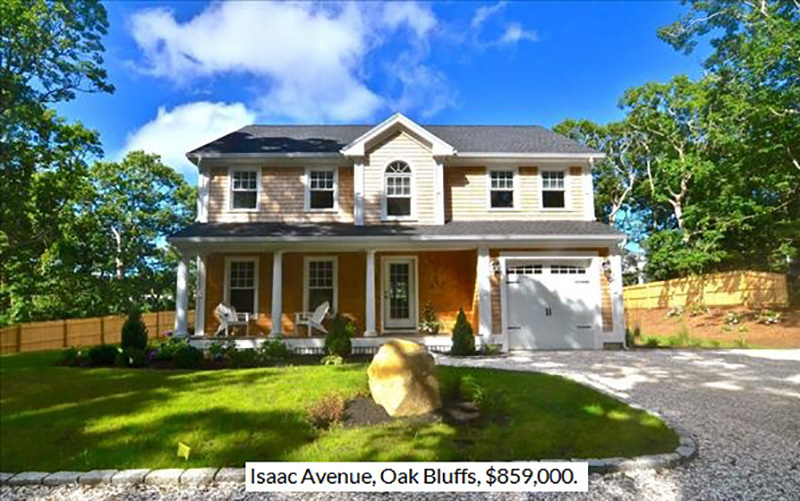 Drive onto the Island favorite crushed stone driveway lined with cobblestone and take in the custom design. The kitchen is a cook’s dream with Carrara Marble countertops, all stainless appliances with gas stove, a pot filler and cafe style refrigerator. All of this is on a quiet road a short walk to the sailing camp and easy access to all down-Islands towns. 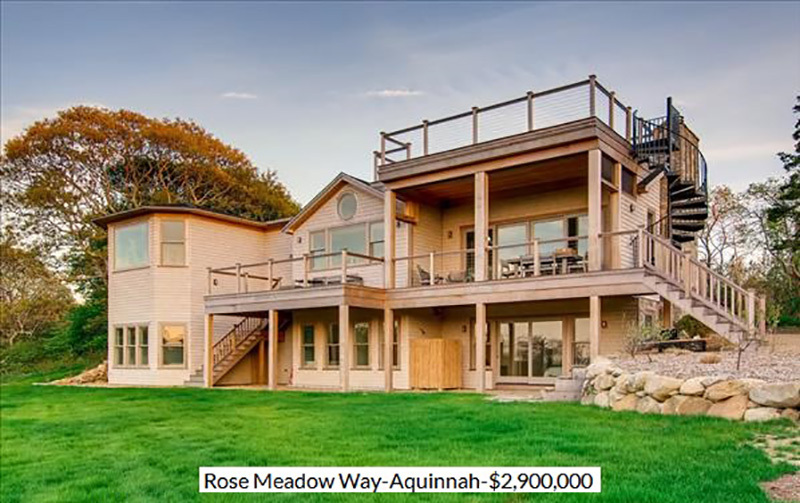 For my personal tastes, nothing compares to the casual elegance of 7 Rose Meadow Way in Aquinnah. 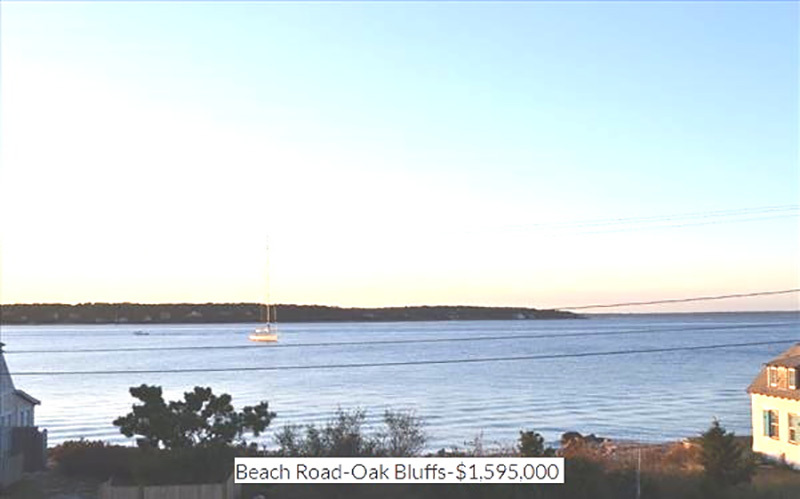 The home features a roof deck with sunset views across Vineyard Sound to the Elizabeth Islands. 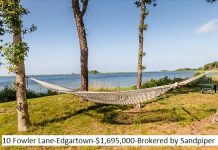 You could spend many hours entertaining guests on the screened porch, in the open floor plan main level enjoying the stone fireplace on cool nights or escaping to the roof deck to sip some tequila and enjoy the universe. In addition to 3 bedrooms and 3½ baths with a lower level office and family room, the 2.9 acre property has a 1-bedroom 1-bath guest house also built with the attention to detail of the main house. 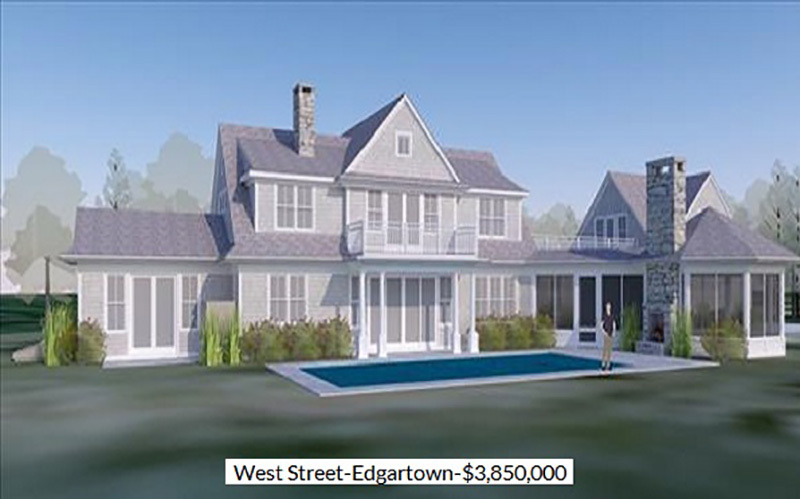 For many buyers, only luxurious poolside living in Edgartown Village will do. 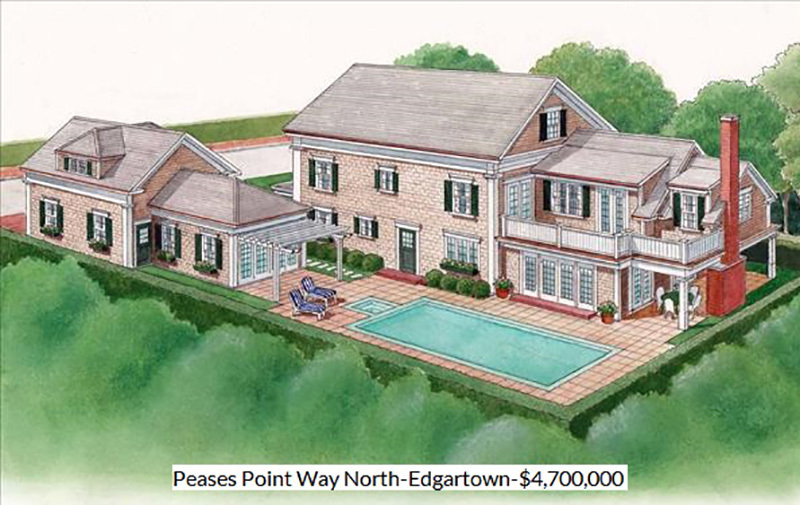 The Patrick Ahearn design at 63 Pease’s Point Way North satisfies that need. This 4500-square-foot home contains 6 bedrooms and was designed to integrate indoor and outdoor living around a private courtyard with Gunite pool. 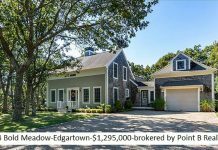 There is a detached carriage house with charming pergola as well as an attached pool house with wet bar and refrigerator and includes a full bath and shower. The main living area has a wall of French doors that open to the pool area with its outdoor Portico and a wood burning fireplace. In addition to all this luxury, the lower level features a deluxe media room plus a guest room and full bath. If this home is “the on,e” you will know it the moment you open the front door. Are you convinced the “new house smell” and an abundance of electrical outlets and communication options is right for you? All properties and more can be viewed at What’s New. For the rest of this Real Estate Confidential, click here. For more Real Estate Confidentials, click here.